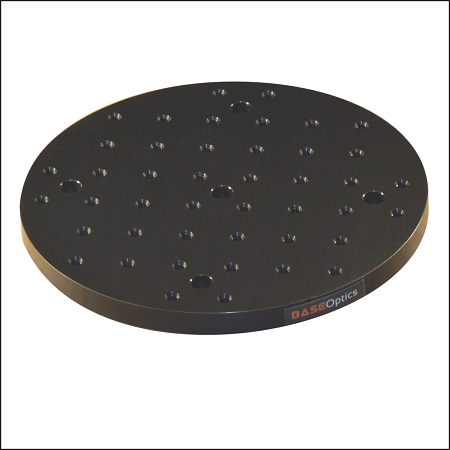 Base Lab Tools now offers circular solid aluminum optical breadboards in three sizes, 8", 12" and 18" (coming to the web this week) diameters. Each breadboards is 1/2" thick and has a black anodized finish. Each aluminum breadboard has 1/4-20 tapped holes on 1 inch centers. Include 5 countersink mounting holes for rigid and single post mounting. You can see the complete line of circular / round breadboards by clicking HERE. Base Lab Tools has relaunched our website to take advantage of a faster, more capable platform than we had previously used. In this new platform, we have much more control over how our products are presented and every aspect is faster and more reliable.